Tim Jones, Erin and Lanson Ronquilio on safari in Foster for the movie Waves From Hell photo Stroh ’92. 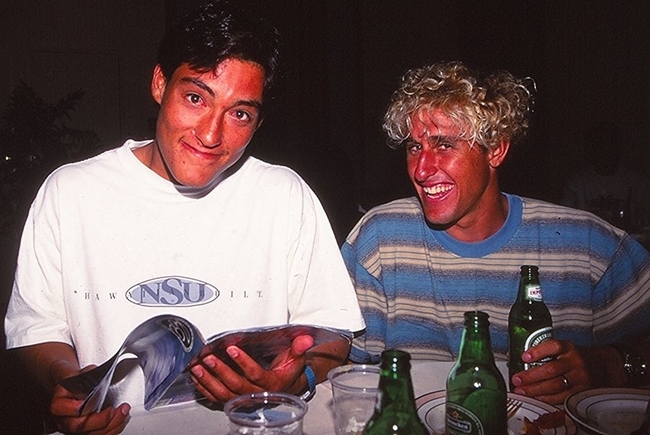 Ronk was one of the most popular Hawaiian bodyboarders of the 90′s . His charging at Pipe brought him plenty of respect from the bodyboard world. Even a near drowning at the worlds most famous wave didn’t deter him one bit or wipe the permanent smile from his face. On his first trip to Oz I was fortunate enough to travel up the coast with the Hawaiian bodyboarder Lanson Ronquilio. Lanson had that easy going Island nature about him, a big smile and was a pleasure to work with. This day we pulled up at Bulls Paddock it wasn’t big about 1 metre but it was clean, green, offshore and the barrels were firing. Photo Stroh ’92. Hawaiian heavy hitter Lanson Ronquilio throughout the 90′s was leading the charge of local Hawaiian bodyboarders and part of the elite Morey team. As an original member of the No Friends team he charged hard in the big stuff but could also mix it up with the air brigade at Off The Wall. This pic below captured Lanson in full flight, photo Bielmann. When Lanson Ronquilio busted onto the Northshore scene in the early 90′s he quickly became the “next big thing” in the sport. Lanson had smooth textbooks moves and charged hard. While his comp results didn’t reflect his natural ability it was his free surfing and clean style that gained him world wide respect. He was signed to Morey, pulled the move that sparked the rise of the gymnastic era , was apart of No Friends and almost drowned once at Pipe. Lanson is typical of the Hawaiian bodyboarders, all about getting the job done without banging his own drum.Pic Stroh ’96.